An 'Event Box' condition is the second most commonly used trigger in a Faction AI script. 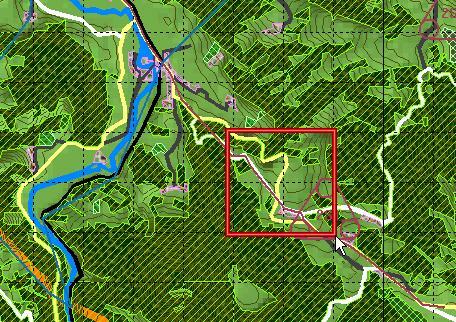 It tells Armored Task Force to look at a location on the map, and, when it contains a specified number of vehicles of a specified group or hierarchy, do something. The basic steps of the addition of an 'Event Box' condition are to add the event box, add the condition, and then edit the condition attributes. 1. The first step is to create an Event Box. See Create an Event Box for details on how to do this. If you are currently editing a Faction AI, you will have to close it in order to do this. The 'Event Box' condition will also accept Event Ellipses. 2. Now, you can add the condition. The condition can be used wherever conditions are accepted: 'Abort Conditions' in the base Faction AI, 'Phase End Conditions' for an AI Order Phase, or 'Order Execution Conditions' in an AI Phase Order. 3. When prompted, select the 'Event Box' condition. 4. This prompt is provided for editing the Faction AI. If you come back and edit the script, and the correct Event Box is no longer selected, select 'No' and the old Event Box will be retained in the condition. 3. NOT COMMONLY USED. You will be prompted to add Data References. If we want the condition to use any of the 'Prerequisite Data' from the initial AI Order dialog, we specify it here. This is most commonly used if we have a large number of events which all look at the same Event Ellipse location. We create an 'Objective Ellipse' item in the 'Prerequisite Data'. Then we specify the stored 'Objective Ellipse' data item we want to look at here. 4. Finally, we tell the condition what we want to look for in the specified location. Box Name. This is used to help you keep tabs on what Event Box corresponds to this condition, since no visual cue is provided. 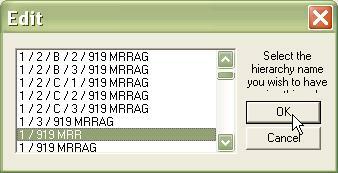 Select the number of vehicles which will make this condition 'true'. Check Enemy? This is in relation to the Faction! If you are building the Enemy Faction AI, then checking this block will look at Friendly and Neutral Faction Vehicles. If you are editing a Neutral Faction AI, checking this block will look for Enemy Faction Vehicles. Remember, at execution time during a game, the enemy will only react to what it sees, so your enemy observation plan must be looking in this box. Box is Ellipse? 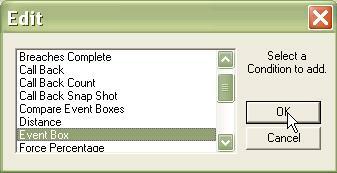 Checking this box will cause the condition to set the current Event Ellipse rather than Event Box as its checked region. Count Unidentified? 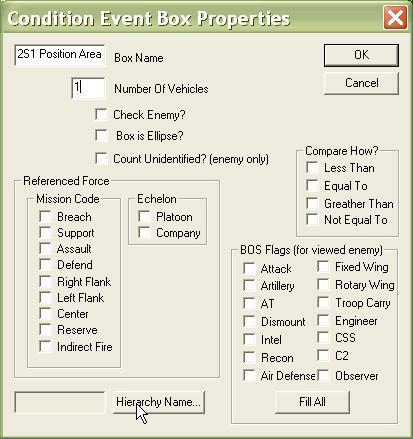 If you also have 'Check Enemy' selected, use this to count both identified and unidentified vehicles in the Event Box. Referenced Force. Not commonly used. Allows you to specify a force to look for by reference rather than by specifying a name. Not used in combination with 'Check Enemy?'. Hierarchy Name. Usually, if you have not selected 'Check Enemy? 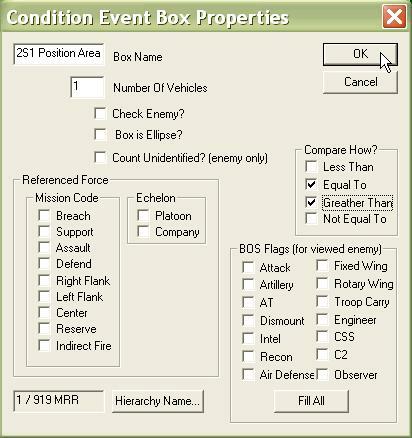 ', you will fill this box to specify the force you want to count in the Event Box. Compare How? Determines when this condition is 'true'. Usually, you will use 'Greater Than' and 'Equal To' for conditions. You might use 'Less Than' to determine when a hierarchy has left the Event Box. BOS Flags. Only valid with 'Check Enemy'. Counts only vehicles of the specified type in the count. If nothing is checked, the condition will count all vehicles. 5. Usually, you will select 'Hierarchy Name' and choose the hierarchy in the Faction you want to count. If 'Hierarchy Name' is left blank, the condition will look at the whole faction. If 'Check Enemy' is selected, this entry is ignored. 6. In this example, we are going to look at an Event Box we drew around the 2S1 Position Area location, for 1 vehicle of the hierarchy '1 / 919 MRR'. If one or more vehicles is in this box, the condition will return 'true'. 7. With the condition set, we can assign orders to be executed when this condition is true.